In October 2014 – Savvycom has been selected as one of Vietnam’s 30 leading IT companies in recognition of the best BPO, IT Outsourcing services. This is a prestigious prize given by Vietnam Software and IT Services Association (VINASA) in the main purposes of praising best IT brands in BPO, IT outsourcing/ Offshoring and software solution for their efficient operations, remarkable prestige and being the leading enterprises cross the country. It’s such a tremendous honor for Savvycom to receive this award. 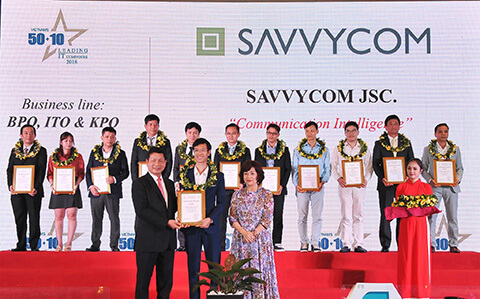 As stated by Dr. Mai Liem Truc, Chairman of the Jury Board, Savvycom was selected for remarkable growth with valuable contribution to IT development industry in Vietnam. Savvycom is also listed in VINASA’s special printed publication and online version in both English and Japanese, the journal has 8,000 copies and is published in 100 different countries to facilitate the recommendation of these businesses to the world. Savvycom team is the combination of experienced IT consultants and software engineers from Germany and Vietnam. Our services go across Software Development life-cycle through partnerships with clients ranging from start-ups to large companies. The service lines focus on Offshore Product Development especially in mobile apps, web apps and web-based solutions such as CRM, BI, ECommerce, Online Payment. By successfully developed hundreds of diverse software products in Health Care, Education, Internet Consumer, Food and Beverage, we are committed to determined standards and measures to ensure that our performance absolutely matches your expectations. If you are interested in learning more about Savvycom, let’s create your own successful story by contacting us right now!